Thousands of people around the world have died in train wrecks caused by natural disasters. 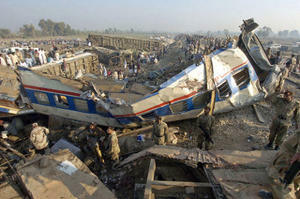 In 2004 the tsunami in Southeast Asia derailed a Sri Lankan train, killing 1,700 people. With modern advances, these tragedies can be avoided — and a Tel Aviv University researcher, working in collaboration with teams from seven countries, is leading the way. It is all part of the European Project FP7 research, “Integrated System for Transport Infrastructures Surveillance and Monitoring by Electromagnetic Sensing,” which includes participants from Israel, Italy, France, Sweden, Norway, Switzerland, and Romania. The international team of researchers aims to connect emerging technologies so that train accidents caused by avalanches, earthquakes and even terrorists can be avoided. “Sinkholes, avalanches, landslides, earthquakes, flash floods — these disasters can cause train wrecks anywhere around the world,” says Eppelbaum. “We are hoping to develop a platform that can be fitted to any railway, passenger or freight carrier, to better predict natural disasters and possible terror attacks on rail lines.” He says that his part of the study should be completed by next year. Climatic features and parameters such as soil types and physical geography can be very different from one region to another, which makes the work even more of a challenge. Some of Eppelbaum’s recent research advances have been reported in the Zeitschrift für Geomorphologie , the Journal of Arid Environment s, and the Proceedings of the SAGEEP Conference, U.S.
Eppelbaum expects their methods will be adopted by the world’s railway systems. As the cost of fuel for cars and planes rises, and environmentally friendly train travel is more heavily promoted, experts predict that more Americans will be riding the rails to work and between cities. In 2008 about thirty million passengers rode on Amtrak trains, and train ridership figures have been steadily increasing. At present, there is no monitoring system for either natural disasters or terror attacks on rail systems in America or anywhere else. Eppelbaum says he has his work cut out for him: putting together different geophysical measurements and formats of sensors, he is collecting very different kinds of data and trying to turn it into usable information.